Keep your dog fresh and clean with the Aromatree's 2 in 1 Deodorizing Spray. 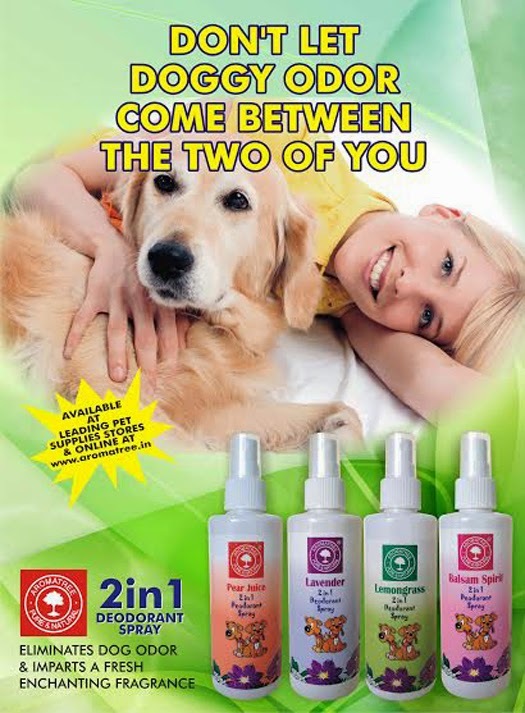 Naturally fight with malodors of your lovely pet with these gentle sprays that comes in 4 fragrances - lemongrass, pear juice, lavender and balsam spirit! These deodorants contain natural essential oils, fragrances, alcohol and a special plant extract that actively removes malodor. Aromatree, for the first time in India, have used unique odor neutralizing technology to produce 2 in 1 Dog deodorants so that you keep your dog clean, fresh, fragrant, healthy and happy. The key ingredients are based on natural plant extracts and does not affect the pets olfactory senses and is non-toxic and enriched with anti-bacterial properties. Looking for a perfect gift idea this DIWALI?